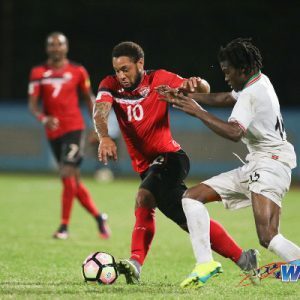 Trinidad and Tobago National Senior Men’s Team head coach Dennis Lawrence is very certain that he wants his players to “take ownership” of the effort to get to the World Cup finals in Russia next year. And to focus on one game at a time although they are scheduled to play two games in four days. He is, however, not yet certain of just whom he wants to lead their effort on the field of play. Photo: Trinidad and Tobago National Senior Team head coach Dennis Lawrence gesticulates during friendly international action against Barbados on 10 March 2017. 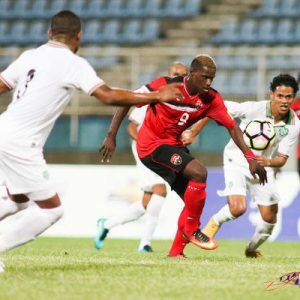 Lawrence yesterday threw down the gauntlet to the 26-member squad he named for the 24 and 28 March World Cup qualifying matches at the Hasely Crawford Stadium versus Panama and Mexico respectively. The 2006 World Cup qualification hero, whose header against Bahrain sealed the Soca Warriors’ historic debut appearance at a senior FIFA World Cup, conceded that what he and his teammates accomplished will forever be etched in T&T’s footballing history. But, he stressed, it is time for this current group to take a page out of their 2006 predecessors’ history book. 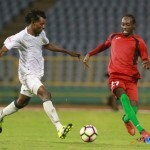 After two losses in their opening fixtures under then coach Stephen Hart, the team currently sits in fifth position in the six-team CONCACAF Hexagonal qualification table. 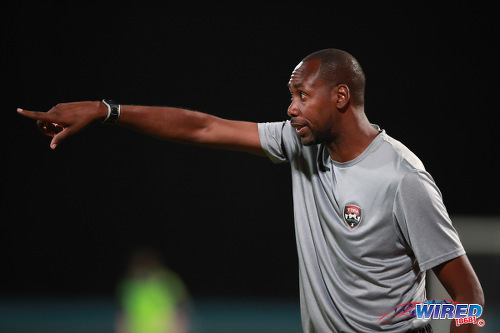 Lawrence pointed out the similarity between that situation and the position in which his 2006 Soca Warriors found themselves before turning it around. So history is on the side of the men in red, white and black. But they have to seize the moment and claim it for themselves. 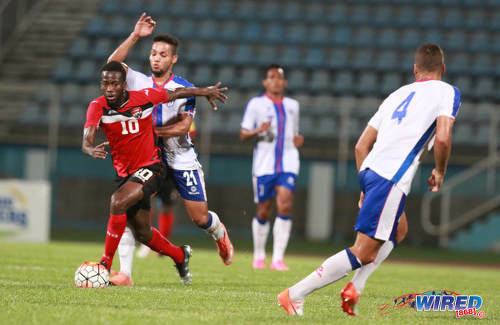 Photo: Trinidad and Tobago attacker Kevin Molino (left) tries to escape from Dominican Republic midfielder Rafael Flores during 2017 Caribbean Cup qualifying action at the Ato Boldon Stadium in Couva on 5 October 2016. In 2005, T&T suffered opening round defeats to USA and Guatemala before claiming a campaign-defining four points at home with a draw against Costa Rica under coach Bertille St Clair and a win over Panama under his successor, Leo Beenhakker. Because he is also targeting a minimum of four points, noted the former Everton FC assistant coach, defeat against Panama is simply not an option. It is true that the Central Americans, who sit in third place on the Hex table at the moment, have had the better of Trinidad and Tobago within recent times. But, according to Lawrence, his players have what it takes to buck that trend. 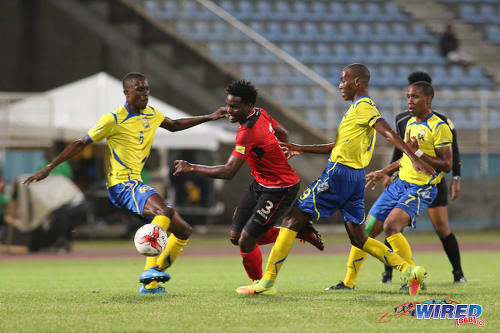 Lawrence’s squad boasts 13 locally-based members, including a single uncapped player in young striker Jamille Boatswain, whose sizzling double strike against Barbados in a 2-0 win in a friendly encounter earlier this month must have sealed his place. The locals have been in training since January and the recently added 13 foreign-based players, Lawrence said, have been integrating well with the training squad. Photo: Trinidad and Tobago midfielder Khaleem Hyland (left) chases Panama midfielder Gabriel Gomez during international friendly action in Couva. The battle for starting berths is expected to be fierce but there is another fight going on within that larger battle. Kenwyne Jones, who wore the captain’s armband under Hart, is back in the squad. Also in, however, is veteran Carlos Edwards to whom the mantle passed during Tom Saintfiet’s short spell at the helm. Jones and Edwards are the only surviving players from the 2006 squad but between them Khaleem Hyland (67), Marvin Phillip (61) and Jan-Michael Williams (75) have over 150 full international caps. So presented with multiple possibilities, the rookie head coach is taking his time and weighing up his options. Lawrence pleaded with fans to be patient with the much maligned Jones [K] and said he believes the giant forward still has a lot to offer his country. “I see a part for Kenwyne to play in T&T football,” he said, “and I think he deserves (…) to be given the chance. 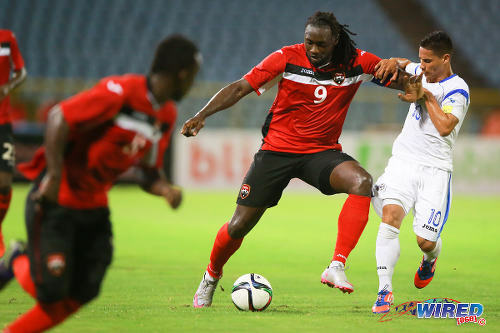 Photo: Trinidad and Tobago captain Kenwyne Jones (centre) holds off Nicaragua midfielder Elvis Figueroa during international friendly action at the Hasely Crawford Stadium on 13 October 2015. Jones may very well be one of the players Lawrence had in mind when he talked about residual “anger” that he would like to tap into. Unveiled as a marquee signing for new MLS franchise Atlanta United, the former Sunderland and Stoke centre-forward has been almost consigned to a place on the bench with Venezuela’s Josef Martinez leading the franchise’s line and banging in five goals in three games so far. Martinez is already being touted as a possible MLS MVP candidate and Atlanta have moved swiftly to make his loan move permanent. That could mean increased frustration for Jones and leave him with a point to prove during his international break. Under Hart, his style of play was key to the national team’s success but his goal-scoring stream has slowed to a trickle in recent times. What is more is that Lawrence has already made public his preference for possession-based football. After the Barbados friendly, he revealed that he would like the team to play a possession-based game and reiterated yesterday that we can expect more of the same on Friday. Asked whether he proposed to adopt a similar strategy against Mexico next week, he said his focus is entirely on Panama and neither he nor his team is looking beyond the present to Mexico. Kick-off in Friday’s crucial Panama game is scheduled for 7pm. Flow Sports announcement: The Trinidad and Tobago Football Association (TTFA) and Flow Sports were unable to reach an agreement with regard to the televising of the Trinidad and Tobago World Cup Qualifier match today. This telecast will not be available on Flow Sports in Trinidad and Tobago. We regret the inconvenience this may cause our local viewers. Viewers in the rest of the Caribbean will be able to see the game live on Flow Sports as scheduled beginning at 7:00 pm. 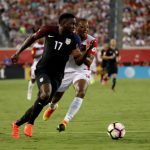 Game Two of the World Cup Qualifiers, USA vs Honduras will also be available live on Flow Sports as scheduled for ALL viewers including Trinidad. We are still in discussions with the TTFA around the rights for local carriage of the T&T vs Mexico match on Tuesday. Tevin, no link that I know of. Try to post in a thread rather than start a new one. To be honest, this site isn’t meant to promote anything. We try to provide smart, relevant news. Some fans may not be the coach, but they are very knowledgeable about football., however it does not help to sit in the stands and hurl insults at the players. Just cheer them on lustily,let them know you are there for them. Save the criticisms for the postmortems. Jones must start, no choice…problem is there is no plan B. Hart didn’t have one Lawrence must have. Some people don’t want to let go of Jones but he really hasn’t been performing well lately. I understood during the qualifiers why Hart was using him as he wanted someone to take down the long ball forward. It was working in the beginning but in recent games it really hasn’t been working. But there’s a reason Lawrence is on the bench with the team and we are looking on. We have to trust the decision of the coach he knows what’s best for his team and his style of play. GOOD LUCK T&T! So u know what that means? He gonna start Jones. I hoping for the best. Lawd…. me eh mind d man on d bench but don’t start him lawd…. The journey to Russia ?? continues tomorrow from 7pm at the HCS ! Well if he wants the fans to support Mr. Bound not to score, he better don’t play no ta ta, when he starts him tomorrow because he will definitely get plenty clapping when he is substituted and our real new prolific Bound to score…..Boatswain enters the game eh. Them really good yes. I’m surprised no skipper has been selected yet. But I hope the boys put in a big performance to get those three points tomorrow . ooh gosh man!! put bussnet boatswain in front!! Good advice coach. It’s about time the fans start being fans and stop being coaches in the stands. The players don’t need to hear your advice while they are playing. Just make a lots of noises!!! I agree with you. I’m only basing my choice on fact that Bateau seems to have a good relationship with the young and senior players and can hopefully help team to heal. I agree with you on Hyland’s attributes. Good points. Bateau is a must start in my humble opinion.. Hyland for Vice Captain.. thinking medium and long term..
Molino as what captain eh, he shouldn’t even be on the Soca Worries team because of his lack of discipline when representing our sweet country steeuuppss. Them really good yes. I really like him to bad eh, and I really cannot wait to see him and our new prolific goal scorer Boatswain in action together on the field. Them really good yes. I actually think Kenwyne Jones did a good job as captain. But if they decide to make a change, Sheldon Bateau might be the best choice for this squad although Jan-Michael and Hyland have great attributes as well. Hyland is the right choice for captain . Why is Bateau a good choice for captain? Hi Lasana how do i get my pic to show when making comments. Hello Abede. Once you register to site, you should have option to log in and add photo. In our home game vs Costa Rica in 2005, it was a scoreless tie but Leo Beenhakker wasn’t the coach it was Bertille St. Clair. In the one all (1-1) draw vs Costa Rica in 2005, Bertille St. Clair was the national coach and not Leo Beenhakker. I watched the interview on youtube…..what was on the tactics board tho? ?